A few years ago we paid cash for our van. Since buying a van we have purchased two other cars for cash. 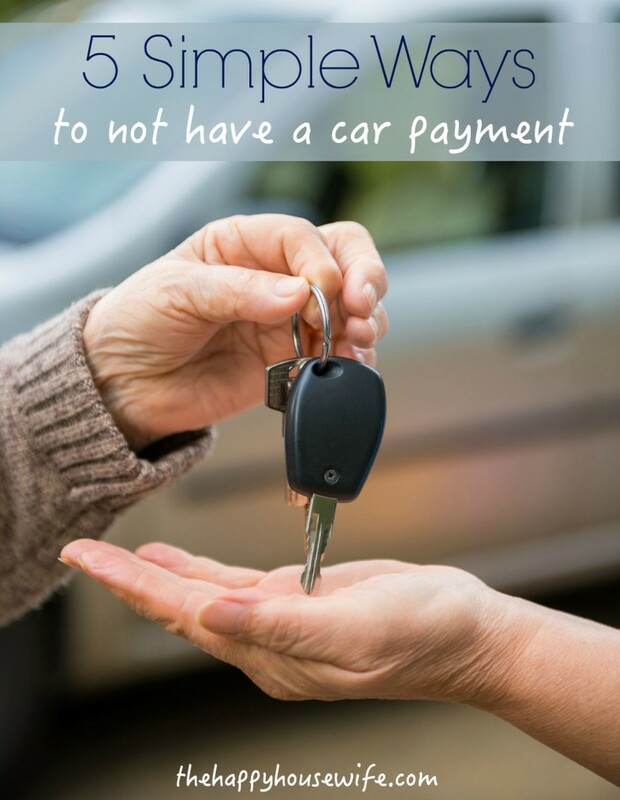 These days having a car payment seems like a way of life, but let me encourage you to have a car payment! If you want to rid your life and your budget of a car payment here are 5 simple ways (or not so simple) to make that happen. When Your Vehicle is Paid For, Keep Driving It! When we owed money on our vehicle we started adding extra money every month to the payment. To make sure we paid extra we made the deductions automatic. Any extra money that came in went to the payment. Side note: if you still have credit card debt or other high interest loans, pay off those first! When we were getting out of debt we only had a car payment left, so all the extra money went towards paying off the car. After you pay off your vehicle, don’t trade it in for a newer model, keep driving it. According to The Simple Dollar, the average American family spends $300 a month on a car payment. If you drove your paid for vehicle for 2 years and saved that car payment money you would have over $7000 CASH saved for a new vehicle. When I think back over the cars we have owned throughout the years, I noticed that we drive them until they wear out or we don’t need them anymore. We drove our suburban for twelve years, then passed it down to one of our kids. My husband has been driving his car for over eight years now. The longer you can drive your car after it is paid off, the more money you are able to save. Even if you have to spend money on repairs, it’s usually cheaper than purchasing a new vehicle. A few years ago we needed a “get around car” nothing fancy, just something for my husband to drive to work. We researched the most reliable older vehicles and narrowed our search. After looking for a few months my husband found a car for $500! This was in the D.C. area, where prices are not cheap. Since purchasing the car we have put another $300 into maintaining and making repairs. After ten months of owning the car we spent a total of $800. That equals an $80 a month car payment, which is significantly less than the national average of $300. Even if this car lasts us a year or two we have accumulated a large savings for another vehicle. That car ended up lasting us about three years. We spent around $1000 in repairs to maintain it during that time. So the car cost us $500 a year to own, which is less than $50 a month! We never had new cars growing up. My dad’s philosophy was to drive a car until you have to pay someone to take it out of your driveway. That meant we would have the same car for years. But it was years of not having a payment. Yes, there were repairs (although my dad always found inexpensive mechanics) but they were less than payments. By the time our cars were ready to be towed out of the driveway (and yes, this did happen) my parents had saved enough money to replace our vehicle for cash. In 2000, we bought a two year old minivan. We took out a loan and paid it off in 3 years. Then we continued to drive this car for 6 more years. During those six years we were able to save our $250 car payment. When we finally sold the van (for about $1000) we had saved around $18,000 for a vehicle. Do you know that you can buy a really nice used car for $18,000? I know this because I am driving it right now. While our minivan wasn’t the prettiest thing to look at we kept driving it because it worked, and it was paid for, and we were savings towards the future. When I wrote about owning only one vehicle a few years ago, people told me it just wasn’t possible. I still disagree. For years we were a one car family, and I have many friends who are still a one car family. Can it be inconvenient, yes, does it require sacrifice, yes, will you miss out on things, probably. But if you need to get your finances under control this is one way to do it. We currently own two vehicles only one which is working, and it’s perfectly fine with me! Yes their are days when it’s tough, but overall it’s a managable thing and we know we are saving money with only the one car. I hope to never have another car payment in my life! Our cars are 10+ years old and we will drive them til they die (like the one has) or until we can afford to trade them in for something better, but never again new or with a car payment! Thanks for this post. It is a world where you see if you can afford a car by how much the monthly payment is. We have owned 1 brand new car and the rest used. We own 2 cards outright now. I have many friends that would never consider purchasing used (Why?? I don’t know). I hope this gets people thinking. We’ve only had one vehicle the whole time we’ve been married (unless you count our bicycles). We have three children that we homeschool, and my husband rides his bike to work each day (it takes him 30 minutes using backroads, it takes our friend about the same in rush hour traffic in his car). When he needs to have the car (minivan actually) for meetings or things for work, he takes it. We’re very flexible about seeing our vehicle as a tool, not something that we each have to have. So, while another car might make things easier, we don’t see things as being that hard–I mean, we’ve been married ten years! YES! We too bought a used car (our only one, and our first car in two years) in the DC area for cash. We went without a car of any kind for two years, using our FEET, the metro and buses and a zipcar for groceries and appointments that were too far for public transit. We’re not just two young adults; we’re a family with a kiddo. Was it glamorous? Oh no. It was embarrassing at times. But you know what feels great? Having a nice car we bought in cash and having zero debt. And honestly, the four miles a day of exercise we got walking at the time was good for us. Not always fun, but certainly healthy. We’ve since moved to a rural area (on a farm! Talk about different from DC! ha!) and we’re getting by with the one vehicle. It just requires communication and planning is all. 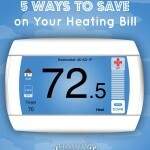 A little inconvenience goes a long, long way for saving money. We do owe on our 12-passenger van, but we got a screaming deal on it when we bought it used – about $3k under Kelly Blue Book. We are buying my husband a “new” work van this weekend for cash. Our total monthly payments for all 3 cars is only $175/month. It’s nice considering we used to pay $500+ for one car! Great topic and tips!!! Not having any car payments is so freeing! My van has been paid off for about a year and last week we replaced hubby’s car (that had been paid off for many years). We had been saving and diligently researching vehicles because we knew there would come a day (in the near future) when something would happen to his car and it would suddenly need much more $$ put into it than we were comfortable with. And that happened (suddenly) last week… We decided not to purchase a clunker, but rather a newer vehicle that would last many, many years. It was so nice, that once all the haggling and back-and-forth was done, all he had to do was pull out the checkbook and write them a check! I’m so thankful we had been planning for that day. I completely agree with this post. We had a 1996 Taurus that we drove until the repairs were more than the car, and then we sold it. By that time, we’d saved enough to buy a nice, used, reliable car. I am very thankful for this car – it starts, it stops, it goes again…. 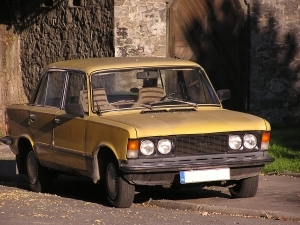 Can you share more about researching older vehicles & buying something that’s still reliable? My husband’s 9 y.o. car is about to bite the dust, we think. I didn’t think it would be possible to find something for $500 that isn’t in need of a total over-haul. Thanks! We just recently went back to two cars after only having one for about a year and a half. My husband rode the bus to work, and it was great. Unfortunately, layoffs required that he put in about 10-15 extra hours per week last year. His parents gave us a car when his dad upgraded. It’s a tiny subcompact, but it makes it so nice since my husband works past the last pickup every day. We were blessed with a car as a college graduation/wedding gift from my in-laws. My husband is a grad student; his stipend is large enough for us to live on (I stay home with our baby girl) and his schooling is paid for, but I don’t know what we would have done without that amazing gift! We are working on paying off student loans from our undergrad days, but we have enough in savings for when the car eventually croaks–which is hopefully at least four or five years from now!! I have never had a car payment in my entire life. My parents gave me my first car at 18 (a used car with no air conditioning). Since then I have had 1990 Mazda Protoge, a 1993 Honda Accord, a 1993 Ford Crown Victoria Police Package, a 1997 Honda Van and a 1999 Van with the electric door behind the drivers side. We have paid anywhere from $500 to $2300 for a vehicle in cash. We have given one vehicle away just because we did not need it, as we had 4 vehicles and then the 3rd vehiclee we sold for $1400 to some people who loved Crown Vic’s and after 10 phone calls we let them buy it. Saying that we had had the car for 5 years and had only paid $2300 for it we received our monies worth. When we bough tires for our last vehicle I looked at the cost of tires for large vans, SUVs and trucks and about croaked. Of course on our very most expensive car repair year we still only spent $2000 on 3 cars and insurance runs about $500 every 3 months on all 3. I learned a lot growing up watching my mother trade in cars every time she got bored. Before I could get my permit, I knew what being “upside down” in a car loan meant. I desperately tried to avoid her mistakes. I did make some car mistakes, but I am a quick learner, so I didn’t repeat any of my own mistakes. We have 2 paid for vehicles now…a 2005 Durango & a 1980 CJ5. We sacrificed 🙁 our 1999 Saturn in 2009 to help someone who needed reliable transportation. Never would have parted with it if I had known I could never own another Saturn. Thanks for the post! We have been free of car payments for years. I love it. I wish we’d save monthly for a new car like you suggest but that isn’t possible in our current financial state. Someday, I hope! We have lived for almost 4 years with one vehicle. It requires planning but it is feasible for us. When the kids and I are walking somewhere I think to myself how much money we’ve saved over the years (and saved the planet, as well). It can be challenging but it has been worth it for us. My husband and I have each made payments on one car in our lives (and we’re in our 40’s). I HATED the experience and vowed never to do it again. We only pay cash for cars and we drive them until they die or until the repairs needed exceed 4X’s the blue book value of the car. We’ve driven a fair number of clunkers, but have NEVER gotten less than 250K miles on a car. I drove a 1981 Honda Accord (that I paid $1100 for) for 8 years and 400K miles. It ran great and was so cheap to maintain and repair. I LOVED that car. I bought it in 1993, 12 years old and got another 8 years out of it. When I sold it, I got $1100 for it. Basically free driving for 8 years. Can’t beat it. Now we drive a minivan that is loaded with options (but bought used at a steep discount), we paid less for it than the stripped down new version, and a used Prius (also loaded and also for less than a new stripped down version.) We will NEVER make car payments again. We own 2 Vehicals, both are paid for. I do think it is bad to have a loan. I also agree that most of the time used vehicles are best. Sometimes it is okay to buy a new car and it can be only a few thousand diffrent from the used price. With the warranty it makes it worth it. A new car is not nessaraly a bad thing. The car payment is a bad thing. True! Someone has to buy the new cars so they’re available for me to buy used a couple of years later 😉 Certified pre-owned cars or used with extended warranties are available. New cars depreciate the second you drive them off the lot so we’ll never go that route. Currently we have two Ford Focus cars. I bought mine used June 2009 since my van of 3 yrs, which was used, was having issues that would cost us more money than we wanted to spend. We had already put $3500 into it. When I traded Caravan in for used Focus, the dealership said van was going away, not sold, due to emissions problems. Now we have two car payments but we are dealing with it and making things work for us. We’ve owned new cars in our marriage and now we’ve been getting used ones. Our current ones are great and maybe will last a long time. When the children were young, hubby worked alot so we had two vehicles. For a time he had a Volvo that company paid for. Then when company gave everyone a van, we got the Volvo and had it 13 years until it met it’s demise via accident in 2007,but we got cash for the metal in the car–$145. Thus the need for our first Ford Focus. Sometimes the horse had to be put down. Thanks for your inspiration, Toni! I actually purchased a brand new car in 1995. I was a teenager and my mother would not let me buy a used car (she had bad experiences with prior used car purchases), although I was the one making payments on that car. Well, after 16 years and little more than 300K miles, my car is still running like a champ! Post college graduation, I got so much crap from my friends and coworkers about not buying a new car. Frugal living is already difficult, but I find that living “not according to others expectations” is even harder. I still love my car and will drive it until it stops moving. I hope to never find out what it’s like to have another car payment.